Booster coils are inexpensive coils which are used, as the name implies, to “boost” heat to a space. A Booster coil is a serpentine type coil with many return bends. Booster coils are rather flimsily constructed to keep the cost low. They are usually used with hot water being pumped through them, but they can be used with steam as the source of heat. If used with steam, the inlet pressure of the steam must not exceed 5 psig. Due to their low-cost construction, higher-pressure steam would lead to premature failure. Booster coils are constructed with eight fins per inch for spacing. Booster coils are only made in one or two-rows. 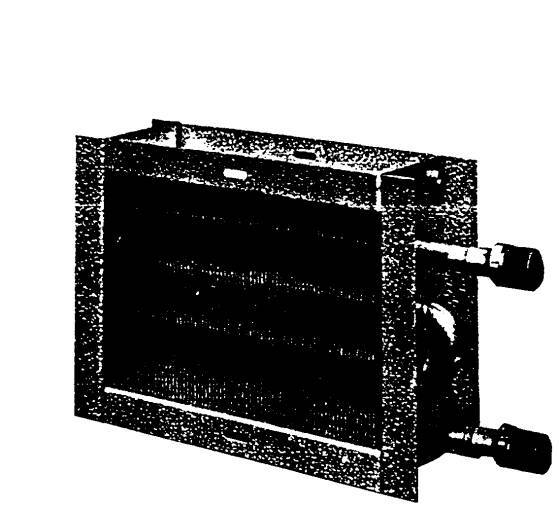 Figure 1 is a picture of a typical booster coil. 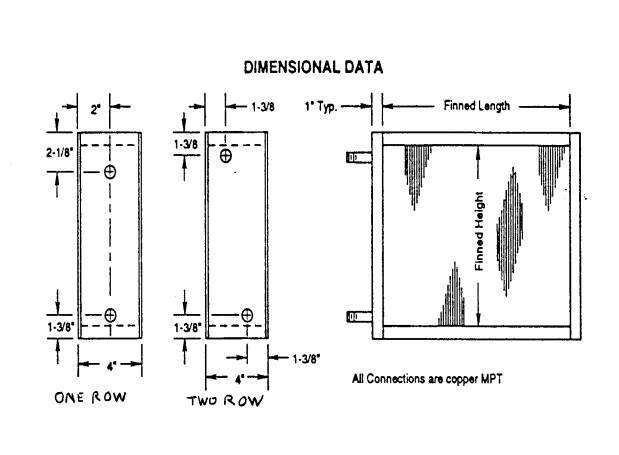 Figure 2 shows the dimensions for booster coils. Note that one or two-row coils are both 4" thick. Only the location of the connections differs slightly. Booster coil sizes are expressed by fin height and fin length. The fin height and length dimensions are usually the inside dimensions of the duct, which the coil is going to go into. Odd size ducts would have to be transitioned to fit stock size booster coils. There is another style of booster coil called a “slip and drive” type. As its name implies, it is slipped and driven into a duct, rather than flanged in, but it is seldom used. All else being equal, and G.P.M. adequate, a two-row coil will produce about 2-1/2 times the BTU’s per hour as a one-row coil. 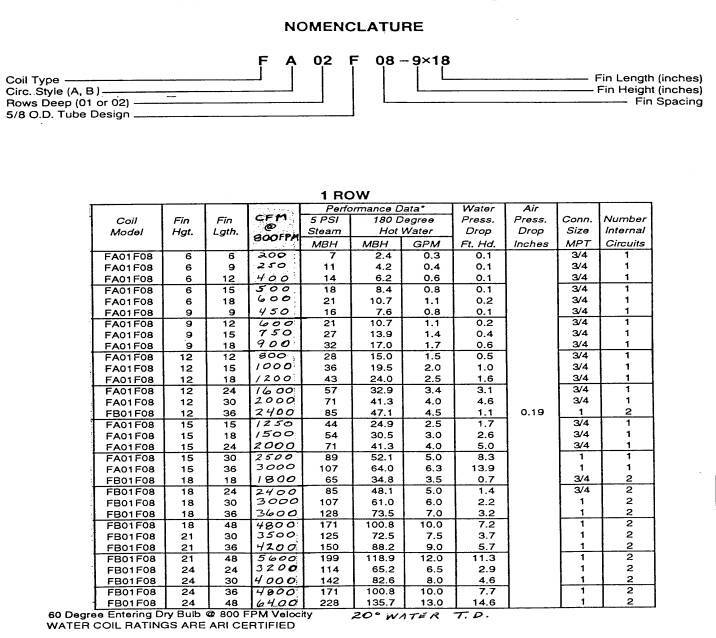 The cost of a two-row coil is about 50% more than a one-row coil. 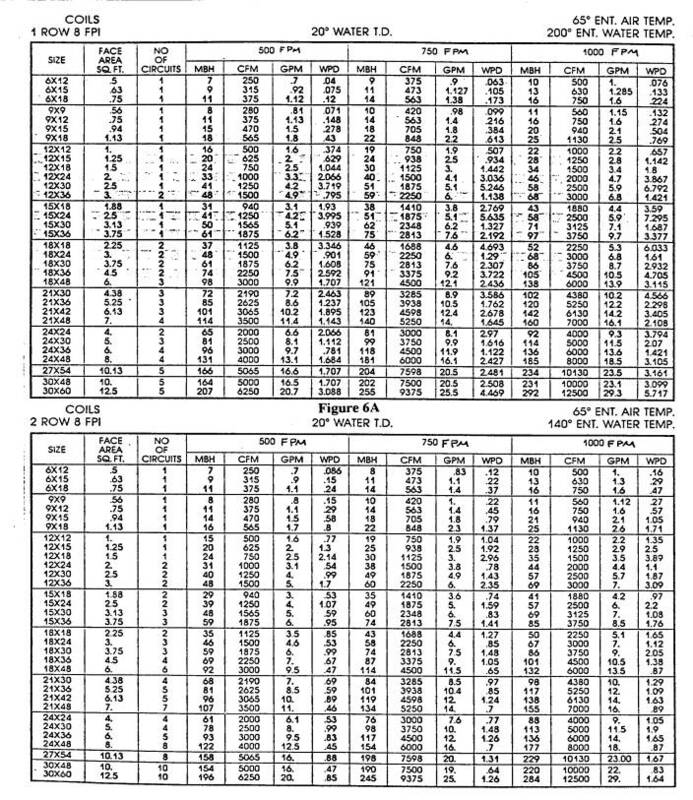 Figure 3 and Figure 4 show all the data for one and two-row booster coils manufactured by Witt. 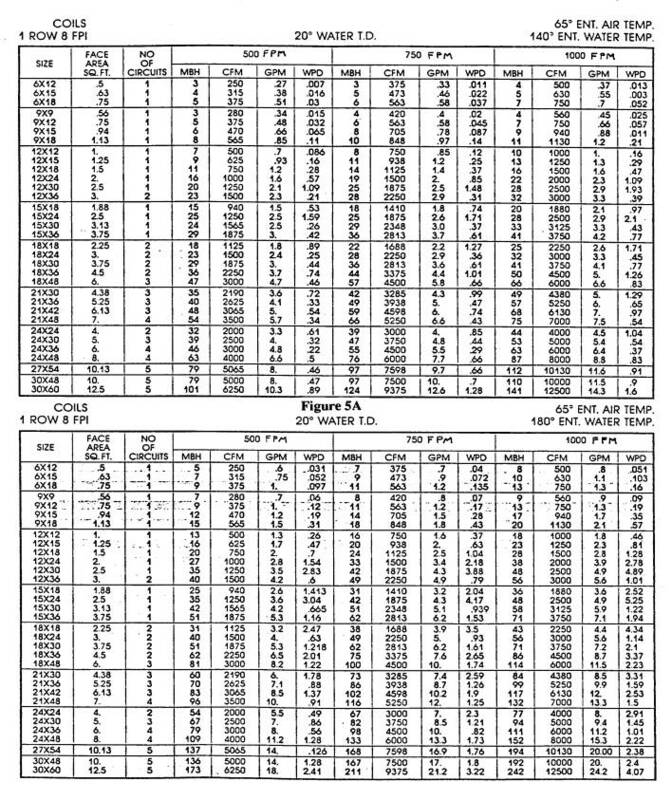 Other manufacturers of booster coil data sheets would appear almost the same, since booster coils are all virtually built the same. 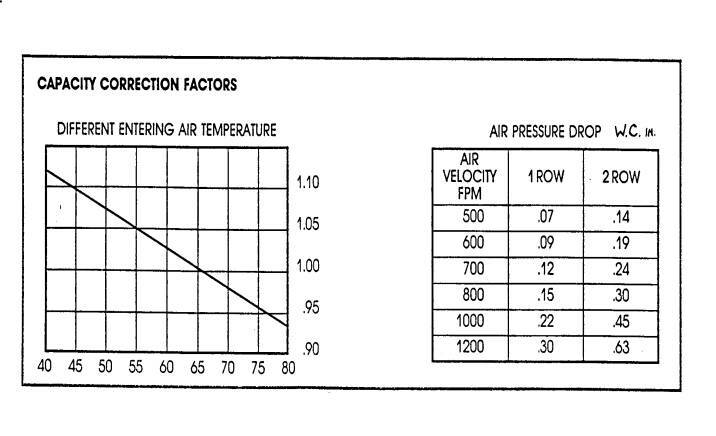 The performance data sheets may vary only because one manufacturer may use 60°F entering air (E.A.) temperature at 800 feet per minute (F.P.M.) velocity, as Witt does, while another may use 65°F E.A. 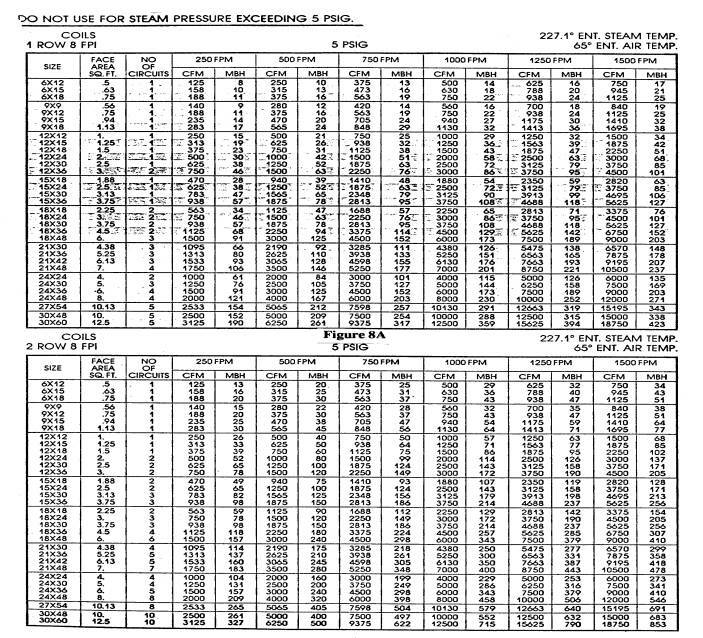 If all the performance data is the same for two different manufacturers of booster coils, the BTU/Hr. ratings will be the same. There are many formulas for selecting a booster coil and they will be described, along with examples, later in this issue. In the real world of booster coils, sizing the typical customer’s specification will be the existing duct size only. As mentioned, most booster coils will be used to supplement or “boost” the heat into an already heated space. Example: A hot water booster coil for a 12" x 18" duct is required for a certain installation. A one-row coil will be 24,000 BTU/Hr. at 180°F entering water temperature, 2.5 G.P.M. flow rate, with 60°F E.A., 800 F.P.M., 20°F water T.D., and will have 3/4" N.P.T. connections. 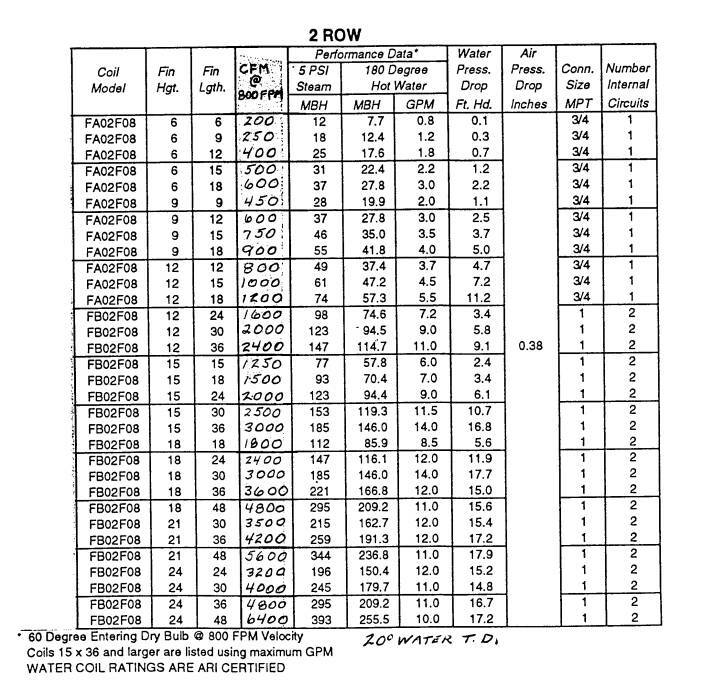 A two-row coil will be 57,300 BTU’s, require 5.5 G.P.M., all other specifications the same. Since the cost of the two-row coil is 50% more than the one-row, one must decide if the added heating effect of the two-row is justified by the cost. 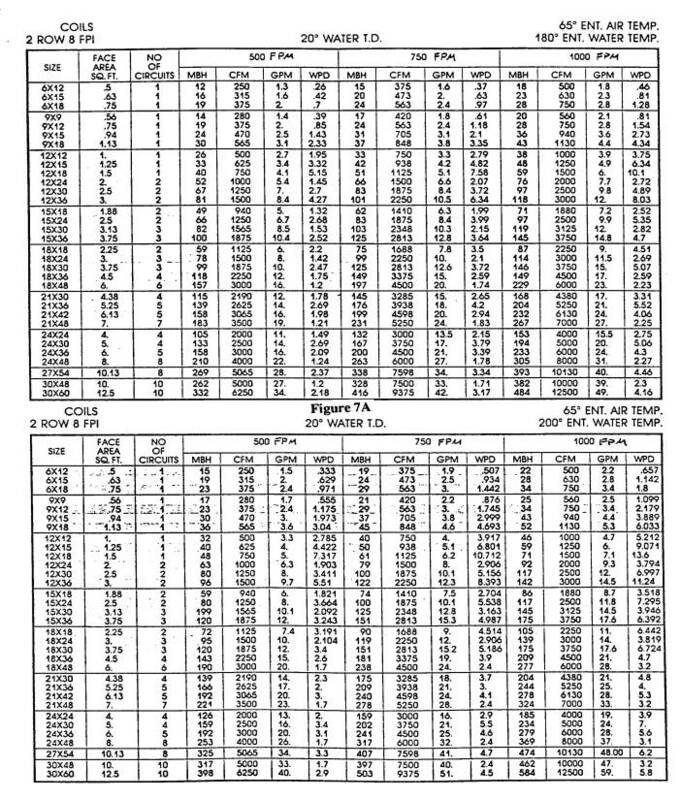 (The performance data for the one and two-row boosters can be found in Figures 3 and 4 respectively). Very often you will encounter higher duct velocities than allowable coil face velocities. Coil face velocities should be in the range of 500 ft./min. to 1,000 ft./min. Do not exceed 1000 ft./min! The formula to determine face velocity is: C.F.M. divided by coil face area in square feet = F.P.M. Example: We are given a duct size of 20" x 18" carrying 3000 C.F.M. 3000 C.F.M. divided by (20 x 18 divided by 144) = F.P.M. 3000 C.F.M. = 1200 ft./min. 1200 ft./min. is too high a coil face velocity. A transition will have to be made to a coil with a face area large enough to get the F.P.M. below 1000 ft./min. Mathematically, many sizes could accomplish an acceptable result, such as a coil with a face of 22" x 22", but there is no stock booster coil 22" x 22" (see Figure 3 and Figure 4). There is a 24" x 24" face area coil. Using this coil, we can see we will have an acceptable face velocity. 3000 C.F.M. = 750 F.P.M. C.F.M. ¸ F.P.M. = Coil face area sq. ft.
D.A. = E.A. + DT. C.F.M. = 3001.975 rounded off to 3000 C.F.M. Figures 3 to 8A cover almost every condition for selecting a booster coil. Changing a condition slightly, such as 170°F entering water temperature instead of 180°F, is not going to make that much difference in booster coil selection. Booster coils need not be critically sized. If two specifications are given for a coil, by using the formulas noted before, you should be able to select a coil that will do the required job for a customer. If no duct size is specified, always select the smallest coil that will work, as it will be the least expensive.